V.K. Brown and A.C. Gange, Insect Herbivory Below Ground. A.D. Friend and F.I. Woodward, Evolutionary and Ecophysiological Responses of Mountain Plants to the Growing Season Environment. J.D. Thomas, Mutualistic Interactions in Freshwater Modular Systems with Molluscan Components. N.E. West, Structure and Function of Microphytic Soil Crusts in Wildland Ecosystems of Arid to Semiarid Regions. S.P. Courtney, T.T. Kibota, and T.A. Singleton, Ecology of Mushroom-Feeding Drosophilidae. Each chapter includes references. Index. Cumulative List of Titles. 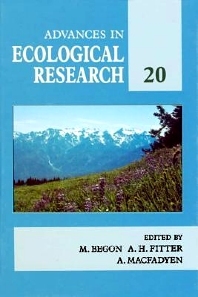 Volume 20 of this series deals with a variety of plant and animal ecology topics.Despite much recent work on herbivory, little attention has been given to insect herbivores active below ground. Brown and Gange describe the ecological adaptations of insects to this abundant but poor quality food resource, and the responses of plants to this potentially very damaging grazing pressure.Plants living at high altitude must be able to cope with extreme climatic conditions, low carbon dioxide levels, and high radiation doses. Friend and Woodward describe these adaptations and discuss the degree to which they are genetically determined or merely the product of physiological plasticity.Thomas presents a modular concept of ecology in which modules contain a resource and its associated consumers, and goes on to examine the general principles which may reflect the various mutualisms between organisms in some example fresh water modular systems.Finally, West examines the microphytic soil crusts of arid and semi-arid soils. Although information on them is currently limited, they are likely to be important in some ecosystems. Ecologists, entomologists, botanists, and freshwater biologists.